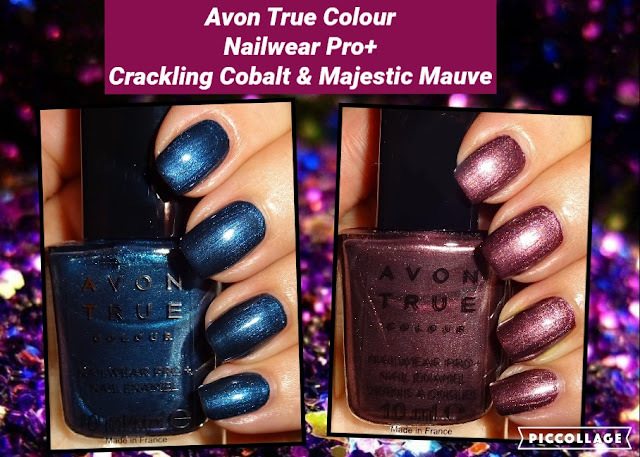 I've got another two new shades from the Avon True Colour Nailwear Pro+ range to show you and they are flippin' gorgeous - Crackling Cobalt & Majestic Mauve. OMG - aren't they just the best shades! So let me obsess a little about Crackling Cobalt, a navy shimmer which reminds me of the twinkly stars in the midnight sky. Pics below with camera flash. And now onto Majestic Mauve, a sumptuous plum shimmer which dazzles like a purple tourmaline gemstone. Pics below with camera flash. The formulation is a good consistency, you could almost get away with one coat if you were in a rush, I'd always recommend two coats for full impact and seal with Avon Mark Gel Shine top coat for durability. Superbly pigmented and a real treat for the eyes. I’ve been informed by Avon that all their nail enamels are 5-Free (free of: Formaldehyde, toluene, DBP, formaldehyde resin, and camphor).